Figure 1. Proportion of conspiracy adherence in survey, excluding “outliers” according to Lewandowsky’s yesterday post (“net”. Aarmist – pink; “skeptic” (CO2TempUp agree, CO2HasNegChange disagree); skydragon (CO2TempUp disagree) – cyan. Horizontal line shows warmist proportion of total survey. Now here is the corresponding figure for the gross counts, prior to removing the “outliers”. It is evident that, even after removal of only the most grotesque responses, the proportion of purported adhence by skeptics has changed. Lewandowsky’s claims that his results “withstand scrutiny” are as bogus as everything in else in this study. Figure 2. As for Figure 1, but for unrestricted survey (“gross”). Multiple results from the article – already questionable in the first place – do not survive the elementary step of removing the most obvious scams. Only one “skeptic” in the revised dataset purported to believe the Moon conspiracy, while 4 “warmists” purported to believe in it. (All 5 responses are probably fake.) Aside from the lack of statistical significance, the eponymous claim of the title is fake. ndings, above and beyond endorsement of laissez-faire free markets. Again bogus. The proportional adherence to the Moon conspiracy and the MLK conspiracy in the revised dataset is higher among warmists than among “skeptics”. Endorsement of these conspiracies, if anything, “predicts” that the respondent is a warmist. the belief that AIDS was created by the government is likely accompanied by the conviction that the FBI killed Martin Luther King or that the Air Force is hiding evidence of extraterrestrial visitors (Goertzel, 1994; Swami, Chamorro-Premuzic, & Furnham, 2009). No skeptics in the revised dataset purport to believe in the AIDS conspiracy. c propositions, from HIV/AIDS to climate change. There are only 5 adherents of the Moon conspiracy in the revised dataset, of which 4 are warmists. Nor does the restriction of one pattern of outliers, as proposed in the Lewandowsky post yesterday, magically cure the failure to make the slightest attempt at data integrity in the first place. Not all scammers did so by pretending to believe in multiple goofy conspiracies. That was one pattern of scamming, but others appear to be present. None of these results were presented in Lewandowsky’s post yesterday. Figure 1. 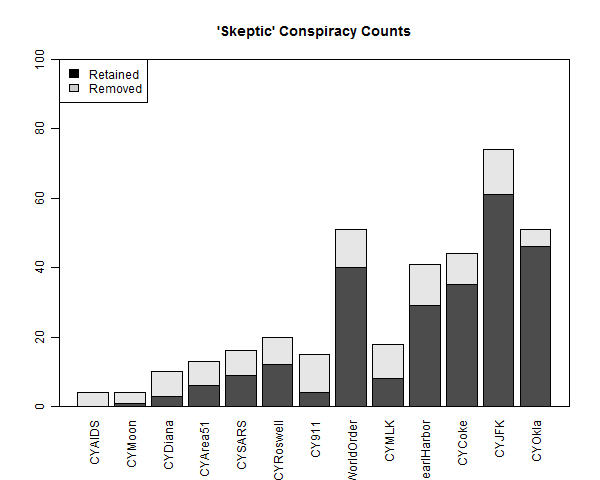 Count of conspiracies “held” by “skeptics” (excluding Co2 conspiracy). The restricted skeptic count for CYAIDS is now 0; it was only 4 before. The restricted skeptic count for CYMoon is now 1 (gross – 4). For the other two signature Lewandowsky conspiracies, CYMLK is now 8 (gross- 10) and CY911 is now 4 (gross – 11). This entry was written by Stephen McIntyre, posted on Sep 13, 2012 at 9:46 AM, filed under Uncategorized and tagged leandowsky. Bookmark the permalink. Follow any comments here with the RSS feed for this post. Both comments and trackbacks are currently closed. appears to be a ‘Descent into Madness’. So, let me ask the question – what is the actual correlation between conspiracy ideation and climate skepticism in the revised data set? Because despite your remarkably thorough selection and illustration of certain specific variables, you somehow forgot to tell us about the overall result. This has become more interesting than I expected. I note, like others, that Lewandowsky is now reduced to ‘cherry picking’ sceptics in the form of Manuel and Monckton and basing his arguments from anecdotes thereof. Super-scientific I’m sure. As for the results he originally claimed, they were fake. What’s left after the clearly fake responses is for me really quite an interesting graph. Though it seems from this data that alarmists are slightly more prone to this stuff, nobody here is going to base any grand theories on such a flimsy foundation. We have more important things to do with our lives. As for the tiresome oil-funding-denialist trope, it would be fascinating to grasp how that came to hold sway so widely. I’m going to look back to Russell C on that. But thanks Steve. They all believe that every argument against their position is being made by a well-orchestrated, fossil-fuel funded disinformation campayne. Should we be shocked they are prone to conspiracy theories? Exactly. The correlation seems so obvious. As is there refusal to consider any fact that might undermine their delusion. Lewandowsky’s signature conspiracies (MLK, Moon, 9/11) – all of which have negligible adherence – are now disproportionally held by warmists. Not surprising. He and his ilk are the same people who can tout over and over the analogy of the well funded “big tobacco scientists” to the “denier” scientists, without a whit of self-reflection that the analogy rather perfectly applies to themselves, and that’s how most people who are listen to them perceive it. It is projection, a reaction formation of sorts. Probably a defense from thinking about the very flaky science behind positive feedbacks, one other indication being their excessive argumentation that dissenters are merely opposing the idea that CO2 is a greenhouse gas. There has recently been a blog post, by somebody, detailing the timeline of the fossil-fuel-funded-disinformation claim, but I cannot find it. Steve: look for Russell Cook’s post at WUWT. You probably didn’t mean to list MLK twice. I guess one should have been 911. Say what you will about, Stephan Lewandowsky, Wile E. Coyote professor, at the Venkman institute of Western Australia for cognitive psychology, he is persistent. Perhaps he is simply playing for the Diederik Stapel retirement at tax-payer expense award? Here Lewandowsky proudly details his $4.4 million in grants. Which includes $762,000 specifically related to Climate Research funding in the last year or two, and none of that includes the $6 million the Federal Government provided him and a few colleagues to found and run ‘The Conversation’ which provides a substantial forum for his ‘Climate Change position’. I have looked and I haven’s found an example of a skeptic who receives funding like that from any source. Yet if you want to talk conspiracy theories, Prof Lewandowsky is always claiming that skeptics are funded by ‘big oil’ or ‘fossil fuel’ but has never offered any evidence of that. And yet, they have to share PCs. Pity. snip – nothing to do with lewandowsky. as you know, I discourage this sort of argument about first principles on topical threads. I think this is already in it’s infancy – you’ll have read answers following your own comment given by a certain Doug Bostrom (38) (http://www.shapingtomorrowsworld.org/lewandowskyDH.html) onwards who seems to be laying the foundations for just such a move! That’ll be 6 million dollars, please. In his latest article, Lewandowsky satirically cites blog comments and internet examples of “warmists” posing as “denialist nutters”. His first linked example comes from an interesting current thread at DeSmogblog. cue. Is it just me, or does this guy look like an opportunistic sock puppet? This comment from Bird sure looks like a Freudian slip to me. Hi. Trying to make sense of figures and graphs. Focusing on MLK figure. Above graphic suggests warmists overwhlemingly subscribe to this. Forgive my ignorance, are you/should you be normalizing/weighting the data to factor in difference in populations for warmers/lukewarmers/skydragons? Or is this being done already? Looks like MLK graph above is generated thus. And visually seems to correspond to the graph. I get it now I think. “Horizontal line shows warmist proportion of total survey.”, provides reference frame to visually adjust for difference in population sizes. Maybe a personal preference, but I find the image misleading and difficult to interpret; initially assumed the chart was normalized. 1) Your definition of “luke warmer” as somebody who scores more than 2 on CO2TempUP, but less than 3 on CO2HasNegChange is tendentious. It turns out that 32 of 127 of your “luke warmers” fit into my category of AGW Acceptors (mean CC plus CauseCO2 score greater than 3.33). Indeed, I significantly hesitated between choosing whether I agreed or disagreed with CO2HasNegChange and would have taken a neutral option if available. According to you, that makes me a luke warmer, which is absurd. For the record, twenty-one of your luke warmers strongly agree that “…the burning of fossil fuels on the scale observed over the last 50 years will cause serious negative changes to the planet’s climate unless there is a substantial switch to non CO2 emitting energy sources.” Thirty-five strongly agree that “…the burning of fossil fuels on the scale observed over the last 50 years has increased atmospheric temperature to an appreciable degree.” That is not a sentiment consistent with the claim of low climate sensitivity and large natural variability associated with luke warmers. They may agree, but surely they must have some doubt as to whether or not the CO2 forced temperature increase has risen enough to be distinguished from background noise, ie, is actually appreciable. With this in mind, I suggest you define “luke warmers” as those who at least agree with CO2TempUp (ongoing emissions will cause appreciable temperature change); who do not strongly agree with CO2AtmosUp (Emissions to date have caused an appreciable temperature increase); and who do not agree that onging emissions either will, or have caused significant negative changes to the climate. As it stands I believe at least around 50% of your “luke warmers” are actually, in your nomenclature “warmists”. 2) Even with those changes, or without them, interpretation of statements, degrees of support, and instructions are too variable between individuals for any such classification as you propose to be either exclusive (ie, to include only lukewarmers) or exhaustive (to include all lukewarmers who took the survey). This means very finely detailed examinations using such classifications are effectively useless. In this case, for example, there is a significant risk that borderline or misclassified cases will significantly change your results. In this instance, defining luke warmers as I have done will slightly decrease the proportion of “warmists” accepting the theory, while significantly increasing the proportion of “skeptics” that do so. Unless your results are robust to slight changes in definition, they are not supported by the data, and may not be in any event due to problems with the data. 3) Your assumption that all high CY score responses are fraudulent is not justified. Most of the the high CY score responses are plausible responses and cannot be determined to be fraudulent on that basis. As surprising as it may seem, there are near universal conspiracy theorists, ie, conspiracy theorists that agree with virtually every conspiracy theory. There are just no (or very few) conspiracy theory theorists that consider all conspiracy theories to be “absolutely true”. Nor can they be determined to be fraudulent from the extreme nature of their distribution. Only twelve responses have a CY score greater than 2 Standard Deviations above the mean, and ten of those form part of a continuous distribution. Only two, statistically speaking are outliers. Consequently, your assumption that all responses with a mean CY score greater than 2.5 is ad hoc. Basing an analysis on that assumption is worse science than anything I have criticized Lewandowsky for with regard to that paper (other than the title, and the criticism there was not of the science). A plausible case can be made that Lewandowsky should not report any result that does not survive trimming the 3% most extreme results. A far stronger case can be made that results that require you to make that cut in order to obtain them are the result of data manipulation, not analysis. Mr. Curtis, I am a lukewarmer and I would fall right in with the two statements you mention and those who agreed with them. Amazingly, I don’t believe in conspiracy theories–not even the one I semi-introduced on another thread here. So whatever it is about fossil fuels which has caused serious negative changes to climate, it cannot be a measurable increase in atmospheric temperature. Perhaps an immeasurable increase can wreak havoc. Perhaps the serious negative change is that it is getting colder or stormier (but not warmer). I would be inclined to mark these cases as invalids. The case IDs are 596, 667, 784, 874 and 915. In fact, there are 95 responses I’ve identified as displaying contradictory beliefs. None of those responses can be trusted, but I’d argue another 45 cannot be trusted either. And if about 10% of responses can be seen to be inaccurate with such weak testing, it makes one doubt the accuracy of the responses as a whole. While this may technically be contradictory, I’m not sure it’s evidence of fraudulent behavior. I think it might be just different readings of the second question. Personally I think that CO2 increases global temperature, I’m not sure that it has yet to cause serious negative consequences. By contrast, burning coal has slear side effects like acid rain, heavy metal contamination, strip mining, mountaintop removal, and particulate pollution. I didn’t take the survey, but reading through the sample questions it took me a while to decide whether any of these counted as a change to “climate”. I decided they didn’t, but some people might read “climate” as “environment” in that sentence and think that there is no warming but are other serious negative effects of burning fossil fuels. It thus might be possible to honestly answer in the pattern you find to be contradictory. An even easier interpretation is that every question is going to have some people who mark the wrong box, whether by reading wrong, clicking wrong, or accidentally inverting the scale. I know that for ratings sites that use “5 stars” or “points out of 10”, there are always a significant number of people who unintentionally mark 1 thinking it signifies Excellent rather than Terrible. Steve, if I am reading your Figure 1 correctly, it still seems to present strong evidence in favour of Lewandowsky’s theory. 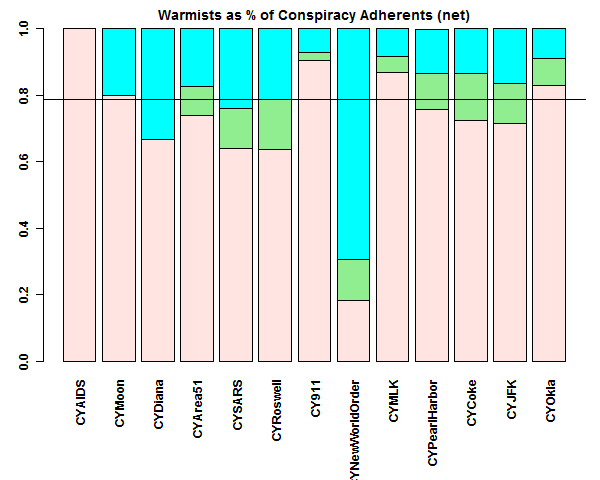 The line shows 80% of the sample are warmists, but less than 80% of warmists support conspiracies in 8 cases. i.e. 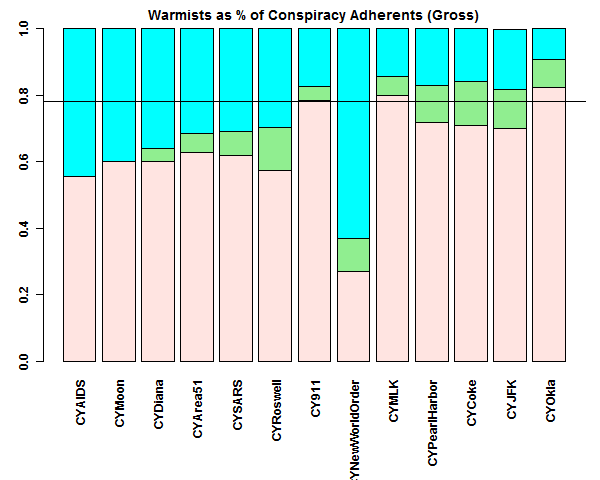 in these 8 cases skeptics are more likely to endorse a conspiracy than warmists. And looking at Figure 3, it appears that these 8 cases are in general the commonest conspiracies – NWOrder, pearl harbour, coke and jfk, for example. I also see from comparing Figure 3, Figure 2 and Figure 1 that removing outliers (defined by you) largely affects only the most infrequently-endorsed conspiracy theories, leaving the most common conspiracy theories largely unchanged (cf Figure 2 and Figure 1). This suggests that removing outliers in the most frequently endorsed conspiracy theories affects warmers and skeptics equally. You could check the effect of outliers statistically quite easily. First you could construct a basic binary variable for “endorses any conspiracy” and compare warmers and skeptics on a chi-squared test after removal of outliers. Then a cochran-mantel-haenszel test for before and after removal of outliers on the same variable would indicate whether the outliers induced heterogeneity, give you odds of endorsing any conspiracy before and after removal of outliers, and enable calculation of a pooled OR in the absence of heterogeneity. Of course this doesn’t necessarily affect the factor analysis (since this is driven by more complex interrelationships between variables) but it would give a basic indication of how much these supposed “fake” data affect the results. You haven’t presented proof here, because you haven’t conducted statistical testing. I hear you’re an expert on statistics, so I wonder why you haven’t bothered with these tests? Steve: Lewandowsky’s article reported claims about the outlandish conspiracies: the Moon Landing, 9/11, MLK etc. And its rhetorical impact depended on this. “Outlier” is Lewandowsky’s term, not mine, as was his definition. In my opinion, the responses are not outliers, but fake or fraudulent. Nor, as I said, is it my opinion that Lewandowsky’s outlier analysis is in any way sufficient to establish a reduced data set with data integrity. That’s the first step. Perhaps the census that is presently being conducted at WUWT will give an idea whether it is even remotely plausible that 243 “skeptics” really did complete the survey. This means if we remove responses where answers are given that don’t make sense with each other, the results become less skeptical and less conspiratorial. Perhaps that means some of these responses were made in an attempt to “scam” the survey, and the fakers didn’t make sure to keep their answers consistent. Perhaps not. However one interprets it, one inescapable conclusion is removing obviously bad data weakens the correlation this paper supposedly finds, and Lewandowsky has done nothing to examine the matter. Perhaps most fascinating? These results are without removing the two responses everyone has focused on. If anyone wants to replicate what I describe above, I can share the code I used. There is probably a better way of doing it than I did, but at least it’d show what I did. However, I’m not sure I should try posting code in here since WordPress would likely screw it up. In the meantime, I can describe what I filtered out. For this, I only looked at four questions, CO2TempUp, CO2AtmosUp, CO2WillNegChange and CO2HasNegChange. The first basically says greenhouse gases cause warming. If any of the others scored higher than that one, I removed the response. After all, if you don’t believe in global warming, you can’t believe in effects from global warming. Next, I removed any answers where C02HasNegChange scored higher than any of the other questions. That question says global warming has already caused “serious negative changes.” If you don’t believe global warming will cause negative changes (C02WillNegChange), you obviously should not believe it has already had such changes. And if you don’t believe global warming has raised temperatures (C02AtmosUp), you shouldn’t believe it has somehow caused serious negative changes. Also, what is the effect of the particular list of conspiracies he included vs. excluded? I recall seeing that he collected responses on an “Iraq WMD” question (whether the war was over something other than WMD) but has withheld the results?? ANyone know what is going on with that issue and why he withheld that data, if indeed that is the case? He seems to have avoided conspiracy questions that would be more likely to collect the more left-wing warmists as counterparts to the more libertarian skeptics (I am well aware that libertarians don’t fall readily into the traditional left-right spectrum). I’m simply asking whether Lewandowsky’s questions are “scientific” and objective in relation to various political/socio/ideological frames that may exist, or does the specific set of questions tend to skew results away from “left wing conspiracy ideation”? I can imagine a couple of conspiracy questions which the warmists would be much more likely to answer in the affirmative (given that there is indeed some amount of political/ideological split). Various “left wing” conspiracy theories which have kicked around which would likely look different for the “warmist” profile, e.g., Bush-Blair-Cheney secretly conspired to invade Iraq KNOWING there were no WMDs to be found, George W. Bush specifically allowed the 911 attacks to occur (a leftist variant of the “Truther” conspiracy view), the Bush admin. specifically allowed New Orleans to be devastated by Hurriane Katrina (a variant of this was propounded in a comment on Real Climate by no less than RC co-founder Ray Pierrehumbert), etc. In general, I can’t see that Lewandowsky et al have given any rigorous attention to what cognitions about “conspiracy ideation” may be or how a survey could really account for different forms and aspects of it. The conspiracy theory that the AIDS epidemic was caused by the release of a US made bioweapon is a very odd one. This theory was deliberately spread as part of the Soviet Unions propaganda against the USA, during the Cold War. Operation: INFEKTION is so well known that it even has its own Wiki page. Steve Mcintyre, your response doesn’t answer my question, and I think you know full well that you can’t use statistics to say anything about the rhetorical impact of the article. Furthermore, you have no evidence that the outliers are fake data; given that excluding them doesn’t change the result, they could just be extreme examples of the same result. In your response you seem to be trying to imply that the issue is the outlandish conspiracies and the rhetoric of the article, but your post itself is clearly trying to say that once you remove the outliers the main result of the paper (holding any conspiracy theory and being a climate skeptic) no longer holds. Yet I have pointed out that a statistical test may not support this implication, and have suggested that the numbers don’t actually change. This is also Lewandowsky’s conclusion. Do you have a statistical analysis to contradict this, or do you accept that after excluding outliers it remains the case that skeptics are more likely to support conspiracy theories? faustusnotes, please look at my comment almost directly above yours. In it, I show removing data that is unquestionably bad affects the data. The unquestionably bad data is both more “skeptical” and more “conspiratorial,” meaning any correlations Lewandowsky may have found between the two would be weakened. And if an obvious check for faulty data can weaken the results of the paper, the paper’s conclusions are highly suspect. Incidentally, finding one model for relationships in data does not mean that model is right. It is quite common for multiple models to exist for any particular data set. Saying you can find a tie between two things does not mean you’ve shown that tie should be believed. Brandon, your comment doesn’t prove what you think it does. The means before and after you remove the “bad” data are actually very similar – you can check this using a basic statistical test, but I think you’ll find they don’t differ statistically. However, what’s important in this type of analysis is the relationship between the groups. Changing the means even by a lot is unimportant if the means change in both the skeptic and warmist groups, which is the point I made to Steve (that he apparently can’t answer). A statistical test will show that removing Steve’s (self-defined) outliers doesn’t change the main result of the paper, because the result is dominated by numbers in the four most common conspiracies, and as his Figure 1 shows, these are more likely to be endorsed by skeptics than warmists. Furthermore, Lewanowsky used factor analysis and SEM, which rely not on the means but on the correlation between variables. If you are sure that the outliers and “inconsistent” data change his results, why don’t you reproduce his analysis on your revised data set? Why are you (and for that matter, Mcintyre) doing different, unrelated analyses? Steve: I’ve tried to replicate Lewandowsky’s method and thus far can’t replicate it. I get different results using factor analysis. In addition, as I understand it, he only used factor analysis for exploratory analysis and then used weighted means. If you can clarify this, it would help. If he archived his code, it would be easy to figure out what he did and test for variation using his methods. Alternatively, if he archived the latent variables that he calculated, that would help. And as I said to you before, the term “outlier” is Lewandowsky’s sanitization of fake data. I did not endorse Lewandowsky’s method as being adequate to deal with the lack of data integrity. I havent interpreted inconsistencies as evidence of scamming. There are other more compelling arguments. In respect to the wacko conspiracies, it is however evident that lewandowsky’s claims are fake and his continued insistence on them should be discontinued. So you have time to respond to this comment but not to clear my other comment from moderation? Perhaps you are engaging in the censorship you decry? If you can’t replicate Lewandowsky’s results, maybe the problem is that you lack the ability? After all, you still aren’t able to explain why you didn’t conduct a simple statistical test of the data you present here, and your explanation of the numbers in the charts in this post is probably wrong. Why should we be expected to believe that your attempts at his research are more accurate than his, when you can’t explain a simple chart from your own work and won’t respond to questions about basic statistical tests? In respect to [sic] wacko conspiracies, you have put up maybe 5 or 6 posts that allege scamming, faking, or lying. You have repeatedly alleged fraud at his site. Your response to Hanich’s email (suggesting the survey was completed multiple times in Hanich’s own lab) was obviously both disingenuous and an extreme example of a conspiracy theory. So no, his claims are not “fake”, you have no evidence of that, and all your behavior supports his findings. To “mod”: I have not misinterpreted the original posts, and Steve certainly didn’t seem to think so in his above replies. All Steve has to do is produce a simple chi-squared test of the effect he claims has changed. I’ve suggested how. Until then, this post is either deliberately misleading or wrong. Steve is quite happy to accuse others of fraud, and if you block me from his website for suggesting the same thing about him then you really are showing a propensity for hypocrisy that I had heretofore suspected but, etc. In accusing people I don’t know and have barely encountered before of fraud, I am respecting the exact nature of this blog. If you don’t like it, stop running around the internet accusing everyone else of fraud! Steve: In my comments, I clearly stated that there was no reason to believe that Lewandowsky himself had been personally involved in the submission of fake responses in the online survey. However, in my opinion (and Tom Curtis’), the survey included fake responses and that Lewandowsky’s methodology was unequal to the task of ensuring data integrity. I do not regard Lewandowsky’s sensitivity test as being an adequate test of fake responses, since it doesn’t cover all styles of fake responses. Nonetheless, even this limited test reduced the number of “skeptic” purporting to hold CYMoon to 1 and left the proportion of warmists adhering to the signature MLK and 9/11 conspiracies as exceeding the proportion of skeptics. One doesn’t need to do a chi-squared test to see this.